This article is about the deep sea trench. For the Canadian band named after the geological formation, see Marianas Trench (band). At the bottom of the trench the water column above exerts a pressure of 1,086 bars (15,750 psi), more than 1,000 times the standard atmospheric pressure at sea level. At this pressure, the density of water is increased by 4.96%, so that 95.27 litres (20.96 imp gal; 25.17 US gal) of water under the pressure of the Challenger Deep would contain the same mass as 100 litres (22 imp gal; 26 US gal) at the surface. The temperature at the bottom is 1 to 4 °C (34 to 39 °F). The trench is not the part of the seafloor closest to the centre of the Earth. This is because the Earth is not a perfect sphere; its radius is about 25 kilometres (16 mi) smaller at the poles than at the equator. As a result, parts of the Arctic Ocean seabed are at least 13 kilometres (8.1 mi) closer to the Earth's centre than the Challenger Deep seafloor. In 2009, the Marianas Trench was established as a United States National Monument. Xenophyophores have been found in the trench by Scripps Institution of Oceanography researchers at a record depth of 10.6 kilometres (6.6 mi) below the sea surface. Data has also suggested that microbial life forms thrive within the trench. The Mariana Trench is named after the nearby Mariana Islands (in turn named Las Marianas in honor of Spanish Queen Mariana of Austria, widow of Philip IV of Spain). The islands are part of the island arc that is formed on an over-riding plate, called the Mariana Plate (also named for the islands), on the western side of the trench. The Pacific plate is subducted beneath the Mariana Plate, creating the Mariana trench, and (further on) the arc of the Mariana islands, as water trapped in the plate is released and explodes upward to form island volcanoes and earthquakes . The Mariana Trench is part of the Izu-Bonin-Mariana subduction system that forms the boundary between two tectonic plates. 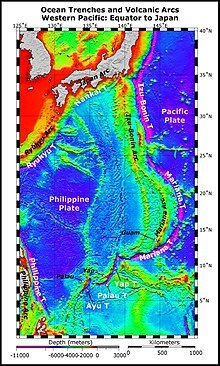 In this system, the western edge of one plate, the Pacific Plate, is subducted (i.e., thrust) beneath the smaller Mariana Plate that lies to the west. Crustal material at the western edge of the Pacific Plate is some of the oldest oceanic crust on earth (up to 170 million years old), and is therefore cooler and more dense; hence its great height difference relative to the higher-riding (and younger) Mariana Plate. 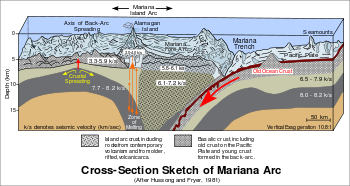 The deepest area at the plate boundary is the Mariana Trench proper. The movement of the Pacific and Mariana plates is also indirectly responsible for the formation of the Mariana Islands. These volcanic islands are caused by Flux melting of the upper mantle due to release of water that is trapped in minerals of the subducted portion of the Pacific Plate. The trench was first sounded during the Challenger expedition in 1875, using a weighted rope, which recorded a depth of 4,475 fathoms (8,184 metres; 26,850 feet). In 1877, a map was published called Tiefenkarte des Grossen Ozeans ("Deep map of the Great Ocean") by Petermann, which showed a Challenger Tief ("Challenger deep") at the location of that sounding. In 1899, USS Nero, a converted collier, recorded a depth of 5,269 fathoms (9,636 metres; 31,614 feet). In 1951, Challenger II surveyed the trench using echo sounding, a much more precise and vastly easier way to measure depth than the sounding equipment and drag lines used in the original expedition. During this survey, the deepest part of the trench was recorded when the Challenger II measured a depth of 5,960 fathoms (10,900 metres; 35,760 feet) at 11°19′N 142°15′E﻿ / ﻿11.317°N 142.250°E﻿ / 11.317; 142.250, known as the Challenger Deep. In 1957, the Soviet vessel Vityaz reported a depth of 11,034 metres (36,201 ft) at a location dubbed the Mariana Hollow. In 1962, the surface ship M.V. Spencer F. Baird recorded a maximum depth of 10,915 metres (35,810 ft) using precision depth gauges. In 1984, the Japanese survey vessel Takuyō (拓洋) collected data from the Mariana Trench using a narrow, multi-beam echo sounder; it reported a maximum depth of 10,924 metres (35,840 ft), also reported as 10,920 metres (35,830 ft) ±10 m (33 ft). Remotely Operated Vehicle KAIKO reached the deepest area of the Mariana Trench and made the deepest diving record of 10,911 metres (35,797 ft) on March 24, 1995. 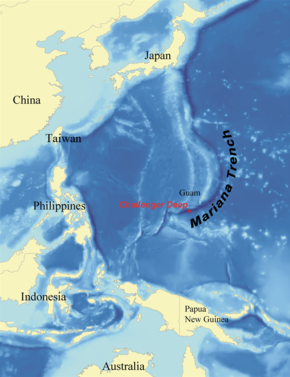 During surveys carried out between 1997 and 2001, a spot was found along the Mariana Trench that had depth similar to that of the Challenger Deep, possibly even deeper. It was discovered while scientists from the Hawaii Institute of Geophysics and Planetology were completing a survey around Guam; they used a sonar mapping system towed behind the research ship to conduct the survey. This new spot was named the HMRG (Hawaii Mapping Research Group) Deep, after the group of scientists who discovered it. On 1 June 2009, sonar mapping of the Challenger Deep by the Simrad EM120 sonar multibeam bathymetry system for deep water, mapping aboard the RV Kilo Moana (mothership of the Nereus vehicle), indicated a spot with a depth of 10,971 metres (35,994 ft). The sonar system uses phase and amplitude bottom detection, with an accuracy of better than 0.2% of water depth across the entire swath (implying that the depth figure is accurate to ± 22 metres (72 ft)). In 2011, it was announced at the American Geophysical Union Fall Meeting that a US Navy hydrographic ship equipped with a multibeam echosounder conducted a survey which mapped the entire trench to 100 metres (330 ft) resolution. The mapping revealed the existence of four rocky outcrops thought to be former seamounts. The Mariana Trench is a site chosen by researchers at Washington University and the Woods Hole Oceanographic Institution in 2012 for a seismic survey to investigate the subsurface water cycle. Using both ocean-bottom seismometers and hydrophones the scientists are able to map structures as deep as 97 kilometres (60 mi) beneath the surface. 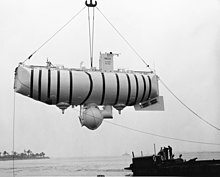 The bathyscaphe Trieste (designed by Auguste Piccard), the first manned vehicle to reach the bottom of the Mariana Trench. Four descents have been achieved. The first was the manned descent by Swiss-designed, Italian-built, United States Navy-owned bathyscaphe Trieste which reached the bottom at 1:06 pm on 23 January 1960, with Don Walsh and Jacques Piccard on board. Iron shot was used for ballast, with gasoline for buoyancy. The onboard systems indicated a depth of 11,521 m (37,799 ft), but this was later revised to 10,916 m (35,814 ft). The depth was estimated from a conversion of pressure measured and calculations based on the water density from sea surface to seabed. This was followed by the unmanned ROVs Kaikō in 1996 and Nereus in 2009. The first three expeditions directly measured very similar depths of 10,902 to 10,916 m (35,768 to 35,814 ft). The fourth was made by Canadian film director James Cameron in 2012. On 26 March, he reached the bottom of the Mariana Trench in the submersible vessel Deepsea Challenger. In July 2015, members of the National Oceanic and Atmospheric Administration, Oregon State University, and the Coast Guard submerged a hydrophone into the deepest part of the Mariana Trench, the Challenger Deep, never having deployed one past a mile. The titanium-shelled hydrophone was designed to withstand the immense pressure 7 miles under. Although researchers were unable to retrieve the hydrophone until November, the data capacity was full within the first 23 days. After months of analyzing the sounds, the experts were surprised to pick up natural and man-made sounds such as boats, earthquakes, a typhoon, and baleen whales. Due to the mission's success, the researchers announced plans to deploy a second hydrophone in 2017 for an extended period of time. As of February 2012[update], at least two other teams are planning piloted submarines to reach the bottom of the Mariana Trench. Triton Submarines, a Florida-based company that designs and manufactures private submarines, plans for a crew of three to take 120 minutes to reach the seabed. DOER Marine, a marine technology company based near San Francisco and set up in 1992, plans for a crew of two or three to take 90 minutes to reach the seabed. The expedition conducted in 1960 claimed to have observed, with great surprise because of the high pressure, large creatures living at the bottom, such as a flatfish about 30 cm (12 in) long, and shrimp. According to Piccard, "The bottom appeared light and clear, a waste of firm diatomaceous ooze". Many marine biologists are now skeptical of the supposed sighting of the flatfish, and it is suggested that the creature may instead have been a sea cucumber. During the second expedition, the unmanned vehicle Kaikō collected mud samples from the seabed. Tiny organisms were found to be living in those samples. In July 2011, a research expedition deployed untethered landers, called dropcams, equipped with digital video cameras and lights to explore this region of the deep sea. Amongst many other living organisms, some gigantic single-celled amoebas with a size of more than 10 cm (4 in), belonging to the class of xenophyophores were observed. Xenophyophores are noteworthy for their size, their extreme abundance on the seafloor and their role as hosts for a variety of organisms. In December 2014, a new species of snailfish was discovered at a depth of 8,145 m (26,722 ft), breaking the previous record for the deepest living fish seen on video. During the 2014 expedition, several new species were filmed including huge crustaceans known as supergiants. Deep-sea gigantism is the process where species grow larger than their shallow water relatives. In May 2017, an unidentified type of snailfish was filmed at a depth of 8,178 metres (26,800 ft). In 2016, a research expedition looked at the chemical makeup of crustacean scavengers collected from the range of 7,841–10,250 metres within the trench. Within these organisms, the researchers found extremely elevated concentrations of PCBs, a chemical toxin banned for its environmental harm in the 1970s, concentrated at all depths within the sediment of the trench. Further research has found that amphipods also ingest microplastics with 100% of amphipods having at least one piece of synthetic material in their stomach. Like other oceanic trenches, the Mariana Trench has been proposed as a site for nuclear waste disposal, in the hope that tectonic plate subduction occurring at the site might eventually push the nuclear waste deep into the Earth's mantle, the second layer of the Earth. However, ocean dumping of nuclear waste is prohibited by international law. Furthermore, plate subduction zones are associated with very large megathrust earthquakes, the effects of which are unpredictable for the safety of long-term disposal of nuclear wastes within the hadopelagic ecosystem. Marianas Trench Marine National Monument, United States national monument at the trench. This National Monument protects 246,610 square kilometres (95,216 sq mi) of submerged lands and waters of the Mariana Archipelago. It includes some of the Mariana Trench, but not the deepest part, the Challenger Deep, which lies just outside the monument area. ^ Mariana Trench is 10,994 m deep, while Mount Everest is 8,848 m tall. The difference is 2,146 m, or at least no less than 2,104 m, accounting for the combined 42 m uncertainty in the measurements. ^ "NGA GeoNames Search". National Geospatial Agency. Retrieved 29 February 2016. ^ a b c "Scientists map Mariana Trench, deepest known section of ocean in the world". The Telegraph. Telegraph Media Group. 7 December 2011. Retrieved 23 June 2018. ^ a b "Mariana Trench". Encyclopædia Britannica. Encyclopædia Britannica. ^ "Official height for Everest set". BBC News. 8 April 2010. Retrieved 24 June 2018. ^ David R. Williams (17 November 2010).Earth Fact Sheet. National Space Science Data Center. Retrieved 23 March 2012. ^ "About the Monument – Mariana Trench". U.S. Fish and Wildlife Service. ^ "Giant amoeba found in Mariana Trench – 6.6 miles beneath the sea". Los Angeles Times. 26 October 2011. Retrieved 23 March 2012. ^ Glud, Ronnie; Wenzhöfer, Frank; Middleboe, Mathias; Oguri, Kazumasa; Turnewitsch, Robert; Canfield, Donald E.; Kitazato, Hiroshi (17 March 2013). "High rates of microbial carbon turnover in sediments in the deepest oceanic trench on Earth". Nature Geoscience. Bibcode:2013NatGe...6..284G. doi:10.1038/ngeo1773. Retrieved 17 March 2013. ^ "About the Mariana Trench – DEEPSEA CHALLENGE Expedition". Deepseachallenge.com. 26 March 2012. Archived from the original on 28 June 2013. Retrieved 8 July 2013. ^ a b c "The Mariana Trench – Exploration". marianatrench.com. ^ Tani, S. "Continental shelf survey of Japan" (PDF). Archived from the original (PDF) on 9 March 2011. Retrieved 24 December 2010. ^ Whitehouse, David (16 July 2003). "Sea floor survey reveals deep hole". BBC News. Retrieved 17 December 2011. ^ "Daily Reports for R/V KILO MOANA June and July 2009". University of Hawaii Marine Center. Archived from the original on 24 May 2012. ^ "Inventory of Scientific Equipment aboard the R/V KILO MOANA". University of Hawaii Marine Center. Archived from the original on 13 June 2010. ^ Duncan Geere (7 February 2012). "Four 'bridges' span the Mariana Trench". Wired. Condé Nast Digital. Archived from the original on 11 March 2012. Retrieved 23 March 2012. ^ "Seismic Survey at the Mariana Trench Will Follow Water Dragged Down Into the Earth's Mantle". ScienceDaily. 22 March 2012. Retrieved 23 March 2012. ^ Strickland, Eliza (2012-02-29). "Don Walsh Describes the Trip to the Bottom of the Mariana Trench – IEEE Spectrum". Spectrum.ieee.org. Retrieved 2013-07-08. ^ a b "Mariana Trench". Earthquake Hazards Program. U.S. Geological Survey. 21 October 2009. Archived from the original on 18 March 2012. Retrieved 23 March 2012. ^ a b c "NOAA Ocean Explorer: History: Quotations: Soundings, Sea-Bottom, and Geophysics". oceanexplorer.noaa.gov. ^ Broad, William J. (25 March 2012). "Filmmaker in Submarine Voyages to Bottom of Sea". New York Times. Retrieved 25 March 2012. ^ Schneider, Kate (2016), “Eerie sounds from the bottom of the Earth”, News.com.au. ^ Chappell, Bill (4 March 2016). "Deep-Sea Audio Recordings Reveal A Noisy Mariana Trench, Surprising Scientists". The Two-Way: Breaking News from NPR. National Public Radio. Retrieved 1 May 2016. ^ "Triton Submarines". Tritonsubs.com. Retrieved 1 March 2012. ^ "DOER Marine". DOER Marine. 20 December 2010. Retrieved 1 March 2012. ^ "Bathyscaphe Trieste | Mariana Trench | Challenger Deep". Geology.com. Retrieved 1 March 2012. ^ Woods, Michael; Mary B. Woods (2009). Seven Natural Wonders of the Arctic, Antarctica, and the Oceans. Twenty-First Century Books. p. 13. ISBN 0-8225-9075-1. Retrieved 23 March 2012. ^ "Giant amoebas discovered in the deepest ocean trench". Retrieved 26 March 2012. ^ a b Morelle, Rebecca (2014-12-09). "New record for deepest fish". BBC News. Retrieved 2017-08-26. ^ "Ghostly fish in Mariana Trench in the Pacific is deepest ever recorded". CBC News. 2017-08-25. Retrieved 2017-08-26. ^ Jamieson, Alan J.; Malkocs, Tamas; Piertney, Stuart B.; Fujii, Toyonobu; Zhang, Zulin (2017-02-13). "Bioaccumulation of persistent organic pollutants in the deepest ocean fauna". Nature Ecology & Evolution. 1. doi:10.1038/s41559-016-0051. ISSN 2397-334X. ^ Jamieson, A. J.; Brooks, L. S. R.; Reid, W. D. K.; Piertney, S. B.; Narayanaswamy, B. E.; Linley, T. D. (2019-02-28). "Microplastics and synthetic particles ingested by deep-sea amphipods in six of the deepest marine ecosystems on Earth". Royal Society Open Science. 6 (2): 180667. doi:10.1098/rsos.180667. ISSN 2054-5703. ^ a b Hafemeister, David W. (2007). Physics of societal issues: calculations on national security, environment, and energy. Berlin: Springer. p. 187. ISBN 0-387-95560-7. ^ a b c Kingsley, Marvin G.; Rogers, Kenneth H. (2007). Calculated risks: highly radioactive waste and homeland security. Aldershot, Hants, England: Ashgate. pp. 75–76. ISBN 0-7546-7133-X. ^ "Dumping and Loss overview". Oceans in the Nuclear Age. Archived from the original on 5 June 2011. Retrieved 18 September 2010. Wikimedia Commons has media related to Mariana Trench. Mariana Trench Dive (25 March 2012) – Deepsea Challenger. Mariana Trench Dive (23 January 1960) – Trieste (Newsreel). Mariana Trench Dive (50th Anniv) – Trieste – Capt Don Walsh. Mariana Trench – Maps (Google). NOAA – Ocean Explorer (Ofc Ocean Exploration & Rsch). NOAA – Ocean Explorer – Multimedia – Mariana Arc (podcast). NOAA – Ocean Explorer – Video Playlist – Ring of Fire (2004–2006).